I figure Bridesmaids is meant to show that women can be just as raunchy as men can. In a certain way the film succeeded, but not without a few missteps. Annie (Kristen Wiig) is just a hopeless mess of a woman: over thirty, single, having lost her bakery business, and the booty-call girl for Ted (Jon Hamm). Her best friend Lillian (Maya Rudolph) then does the unthinkable at the worst time for Annie: she gets engaged. Of course Annie will be Maid of Honor, but there are a few complications. For one, as Maid of Honor she has to oversee all the festivities for the other bridesmaids: not something she can do well with a budget of nothing. For another, she has a rival for Maid of Honor: Helen (Rose Byrne) a beautiful, rich, glamorous woman; in short, all the things Annie isn't. Soon, an unofficial competition erupts between Annie and Helen. Meanwhile, the other bridesmaids: the frazzled, bitterly married Rita (Wendi McLendon-Covey), the ubersweet newlywed Becca (Ellie Kemper), and the fiancee's sister, the raunchy and vulgar Megan (Melissa McCarthy) all join Helen and Annie to begin the traditions involved in accompanying the bride, such as getting the dresses, planning the bachelorette party and the wedding shower. Annie's very limited funds are no match for Helen's large bank account, and slowly Helen starts taking over. On their way to Las Vegas, Annie, who not only is afraid to fly but is too proud to have Helen pay for her ticket and thus flies coach, has a meltdown caused by sedatives and booze. After they all get kicked off the plane, and after seeing how Helen used her Parisian-themed bridal shower causing Annie yet another meltdown, Liilian and Annie break company. Into this mix we see Annie's efforts to start a romance with Officer Rhodes (Chris O'Dowd), a sweet cop who is sweet on her and her cupcakes. Annie being Annie, she manages to make a mess of that too. Depressed and having moved back home with her mother (Jill Clayburgh), it is Megan who goes to her, tells her to pull herself together and fight for herself. On the wedding day itself, it's Helen who shows up at Annie's, desperate to help find Lillian who has disappeared. With help from a very reluctant Rhodes, they find Lillian is at her old apartment. Lillian, overwhelmed by all the planning, hides out. Annie, ever the loyal friend, pulls her through and everyone gets the man they want. I know many people found Bridesmaids funny, and I suppose it's a sign of progress that women can be just as raunchy and vulgar as men. I will say that there were funny moments and funny performances in Bridesmaids, but on the whole there were more things I disliked about it than liked. One aspect of Bridesmaids that I was particularly unhappy with is the excessive amount of bathroom humor, in figurative and literal sense. A very lengthy scene involved food poisoning striking all the bridesmaids except for Helen (she didn't eat the same thing everyone else did). It may be that people today find the sight of women vomiting into toilets, onto each other, and defecating into sinks a laugh riot. For me, I thought it was cheap, and sad, and tawdry, and a bit sick. I wouldn't find that funny with men doing it, particularly the sink business, and I don't find it funny with women. As much as Bridesmaids is being hailed as some sort of cinematic breakthrough, I couldn't help think Annie was a remarkably unfunny character. This woman is self-destructive, whiny, excessively needy, insecure, a bit psychotic/irrational, and fearful of anyone who is in any way better off than she is. I couldn't bring myself to root for such a character, and in fact I found I disliked her. I also didn't get much of a handle on some of the other bridesmaids, in spite of its two-hour length. Becca is a sweet, naive girl who is still in the glow of her marriage, but really, having her share a hint of a lesbian kiss with Rita on the plane? For a movie as long as Bridesmaids, the real story involved the competition between Helen and Annie with only Megan having any substantial role, and to my mind it felt like the other bridesmaids were there to just make a full party. This isn't to say there aren't funny moments, even warm and oddly tender moments, within Bridesmaids. There are certain scenes in the film that are laugh-out loud hilarious. The scene at the reception when Helen and Annie are attempting to one-up each other in their toasts is extremely funny, as is Annie's first meltdown on the plane. I will also point out that every time Annie tries to sell jewelry at her job had me laughing at just how she keeps letting her personal life interfere with her salesmanship. As I said, there are funny moments in Bridesmaids, but some of it, especially the more vulgar parts of it fell flat with me. The funny people in Bridesmaids to my mind are some of the supporting players. McCarthy as the brazen and bawdy Megan steals every scene she's in. Hamm shows a surprisingly funny side to himself as the shallow Ted, and seeing him make such a radical departure from the generally humorless and extremely serious Don Draper of Mad Men shows Hamm can do comedy quite well. O'Dowd brings a surprising and curiously realistic take on Officer Rhodes even if no explanation as to why a Wisconsin state trooper has an Irish accent is given, though the script hints at it with Annie's surprise that a Wisconsin state trooper didn't have to be a citizen, but I digress. In her final role before her death, Clayburgh was delightful as the mother who wants to help her daughter but who doesn't realize how she bungles the job of helping her child through her various crises. She will be missed. The scenes between O'Dowd and Wiig were some of the best in Bridesmaids because we could get at a sweet, though oddball, romance. My take is that if the script by Wiig and Annie Mumolo had not gone so much for raunchy humor or made Annie such a whiner and borderline psycho (the second meltdown at the bridal shower made her look like a complete lunatic completely unhinged and a danger to herself and others), Bridesmaids could have been funnier. 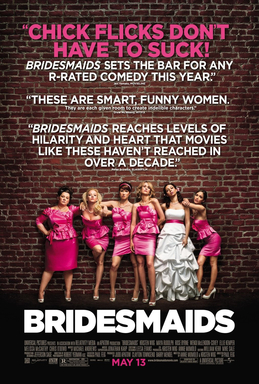 I think that my biggest beef with Bridesmaids is that it is trying too hard to be funny. The whole scene of trying to attract Officer Rhodes' attention by having Annie violate all the driving laws she can think of so that he can pull her over didn't strike me as funny but as attempting to be funny. In short, Bridesmaids has some positive things to it (the supporting players of McCarthy, Hamm, and O'Dowd) and some funny moments (the reception duel, the flight into 'terror'), but those were pushed down by others (I didn't laugh once in the dress shop scene: just don't find that kind of thing funny). Still, I wouldn't reject an invite to the wedding, and I would take a puppy home too.